Enrique Valero developed his work experience mainly between Spain and United Kingdom. He worked in Marketing & Communications industry for well-known wine & spirits brands as Diageo Group, Arco Bodegas Unidas or Grupo González Byass. 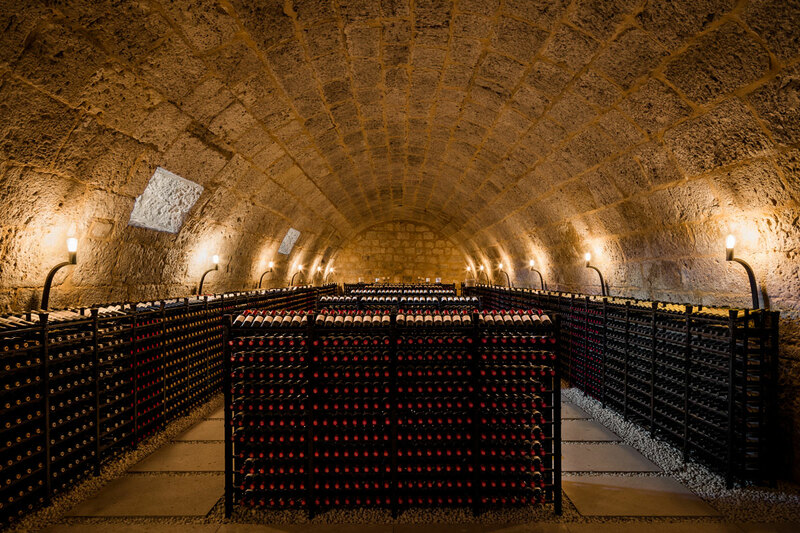 Then, he joined Abadia Retuerta in 2009, holding the position of CEO of the winery, with the objective to consolidate his wines at national and international high level. 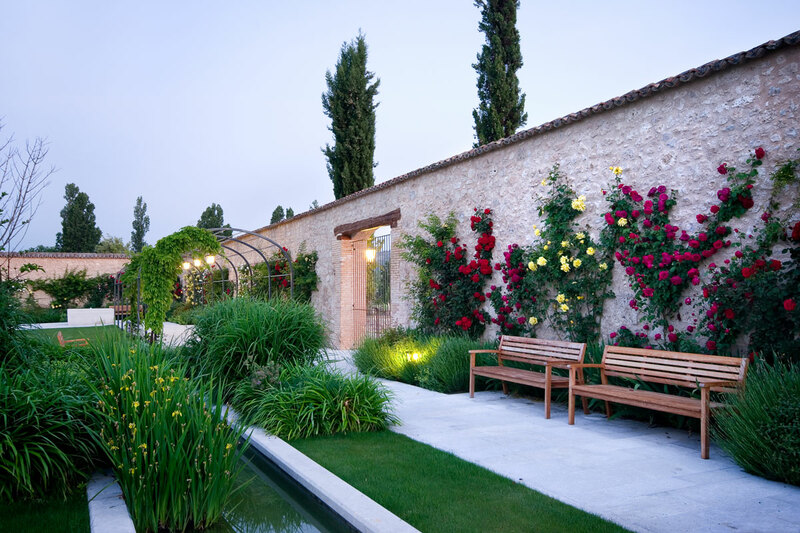 After a few years, he was named CEO of Abadía Retuerta LeDomaine. He is also an associate professor at the International Business School in Madrid (IE), member of the advisory Board of the Wine fund “Vini Catena” from Banca March and author of the book “How to manage a winery”. Day after day, we strive to exceed the expectations of our guests and make their stay unforgettable. In 1145, the marriage of aristocracy and piety brought about the abbey when the Lord of Valladolid’s daughter Doña Mayor donated “terras et vineas” to the church. Abadía Santa Maria de Retuerta was built for the Premonstratensian Order. Baroque-Romanesque in style, it has a classic Benedictine layout of church, cloister, refectory, chapterhouse and hospedería. The renovation respects the integrity of 900 years of history. The original monastic uses of rooms were maintained, the Romanesque-Baroque architecture conserved, not altered. Opulent new furnishings, lighting and climate control make modern guests feel at home without compromise to the ancient site. 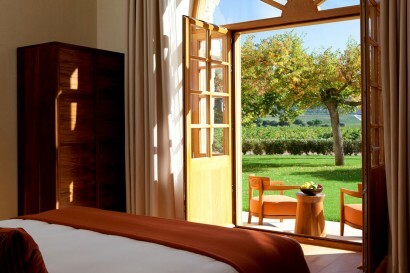 This stunningly restored 12th-century abbey sits amidst 500 acres of vineyards along the Duero River, which guests can explore by bicycle, foot or Land Rover tour. 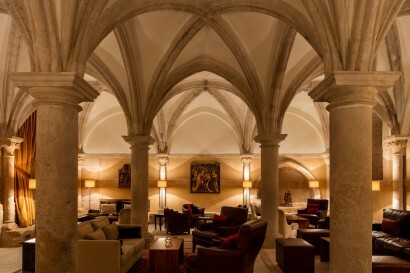 Monks’ cells and stable blocks have been transformed into 30 tranquil rooms and suites offering a Full Butler Service; let the world’s first Spa Sommelier recommend the perfect “Oenotherapy” treatment. The Refectorio, the abbey’s original dining hall, today is a One-Michelin-Star sanctuary of haute cuisine, impeccably matched with award-winning wines of the Abadia Retuerta estate. The hotel opened in March 2012 after six years of restoration, guided by the architect Marco Serra. 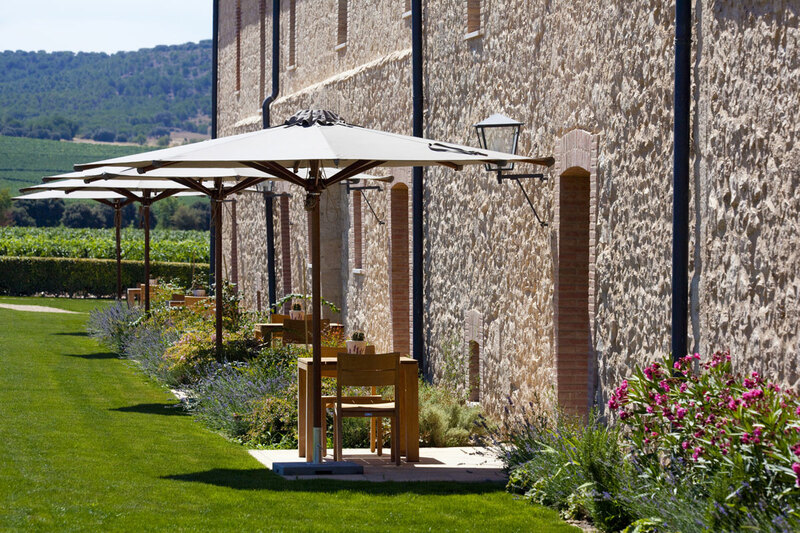 In July 2015, the hotel opened the Santuario LeDomaine Wellness & Spa, an outdoor swimming pool and a pool bar surrounded by vineyards as well as eight spectacular additional rooms in the Stables Building. • Visit 900 years of History through the XII century Abbey. • “Spa Sommelier Experience” in Santuario LeDomaine Wellness & Spa. • Unique Gastronomy & Wine Experiences. From Valladolid Airport (VLL): 27 miles / 45 km. From Madrid Airport (MAD): 110 miles / 180 km. From Madrid city centre: 190km far. 55min in a high-speed train from Chamartin train station to Valladolid. From Rioja: 275km far, Bilbao: 298km far, San Sebastian: 362km far, Oporto: 432km far. 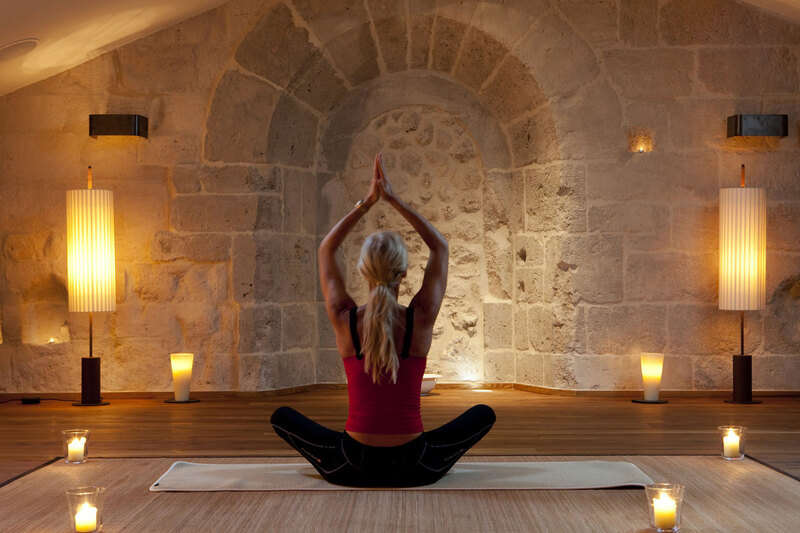 Santuario LeDomaine Wellness & Spa Center: personalized treatments by our Spa Sommeliers. 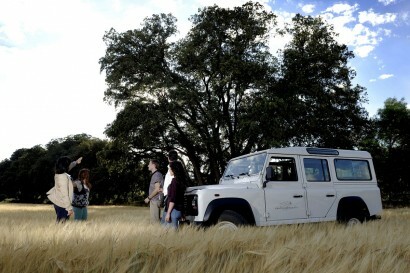 Abadia Retuerta Tour: 4×4 tour through our vineyards and the winery, including a wine tasting. Horseback riding, Hiking and Biking through “The Trails of Abadia Retuerta”. Helicopter flight around Ribera Del Duero. On the bell tower of the former Santa Maria de Retuerta Abbey, eagle-eyed guests may spy an extra-large bird’s nest – the spring and summer home to a returning stork family and their young brood. • Number of Suites: 3. • 1 Master Suite. It consists of one lounge, one bedroom (one king-size bed), one bathroom (Carrara marble), one restroom and walk-in closet. Nespresso coffee machine, two TVs (Bang & Olufssen, with an integrated Mac and Apple TV, and Loewe) with international channels and Blu Ray,Digital body analysis scale and DVD player. Carrara marble bathroom.100 m2 (1076 sq.ft.). • 1 Two Bedroom Suite. It consists of one lounge, one double bedroom (queen-size bed) with complete bathroom (Carrara marble), one twin bedroom and one toilet with shower (Carrara marble). Nespresso coffee machine, two Loewe TVs with international channels and Digital body analysis scale. 100 m2 (1076 sq.ft.). • 1 Junior Suite with a four-poster bed (queen-size). It consists of one hall, one bedroom and one bathroom (Carrara marble). Loewe TV with international channels and Nespresso coffee machine. 63 m2 (678 sq.ft.). •Number of Luxury rooms: 27. • 10 Classic Double with Queen Size bed. Loewe TV with international channels. Bathrooms in stone-mosaic surfaces. Private garden with terrace furniture and deck chairs under request. Disable room available (under request). 32 m2 (345 sq.ft.). • 4 Classic Twin with twin beds and direct access to Santuario available under request. 32 m2 (345 sq.ft.). • 13 Superior Double rooms with Queen Size bed. Two balconies with views from the bedroom and the bathtub, Loewe TV with international channels and Nespresso coffee machine. Bathrooms in stone-mosaic surfaces. 34 m2 (452 sq.ft.). • Number of rooms, (keys) in all: 30. • Refectorio. Awarded with One Michelin Star, it is guided by our Chef Marc Segarra. 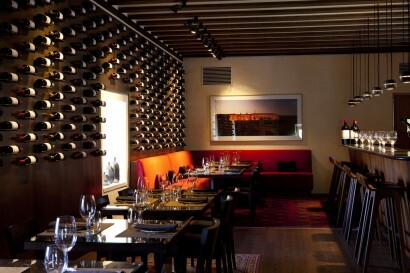 A gourmet restaurant where we offer two different tasting menus based on local and seasonal products. Opening hours: from 20:00h to 22:00h. • Vinoteca. An informal and à la carte restaurant. 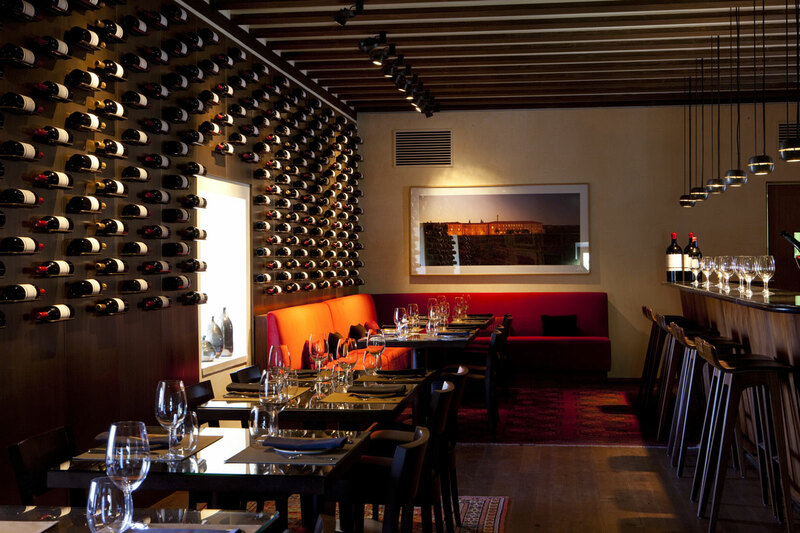 It offers a creative twist to the traditional “tapas” cuisine paired with our awarded wines. Opening hours: 12:00h to 22:00h. • Jardin del Claustro. Summer nights Vinoteca’s choices are offered at an outdoor terrace to delight a simpler, fresh and seasonal dishes. Opening hours: 20:00h to 22:00h. • Pool Bar. In summer season we have an outdoor Pool Bar with a terrace, where we offer an informal and simple carte. Opening hours: 12:00h to 20:00h. The spa comprises an indoor swimming pool and separate male and female wellness areas, including: sauna, steam room, experience and thermal contrast showers and relaxation room. 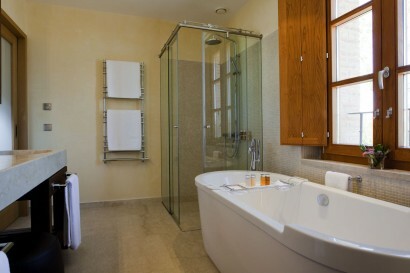 Specifically catering to couples, we have a fully equipped private Spa Suite. Summer season: outdoor swimming pool surrounded by vineyards as well as an outdoor Pool Bar with a terrace. At the Santuario, guests have joyful options: indulge in their favorite treatments that are familiar and soothing, or opt for innovated oenotherapy-inspired experiences that are spirit-lifting and energizing. The spa treatment menu offers a wide range of high-end brands such as Anne Semonin, Evidens de Beauté, Natura Bissé and Mama Mio, this last one specialized in Pregnancy Spa Treatments. For safety reasons, access to children under 16 years is not permitted. Gym: TRX, Kinesis with a virtual trainer, cross-trainers, running machines, static bikes, Swiss balls, and other accessories for Pilates mat work. • XII century Church: 180pax, banquet and cocktail set-up. • Sacristy: 20pax, board set-up. • Sala Consejo: 20pax, board set-up. • Sala de Reunión: 34pax, board and “U” set-up. • Cloister: 180pax, banquet and cocktail set-up. • Horseback riding on the banks of the Duero River. •The Chef’s Secrets: pastry cooking class. •Falconry: flight display, special activity for groups. •Yoga, relaxation and meditation at our special Yoga room. • Best hotel in Spain & Portugal 2017 by Conde Nast Traveler. • Hideaway of the year 2017 by Andrew Harper. • One of the best hotels in the world by Tatler travel guide 2017. 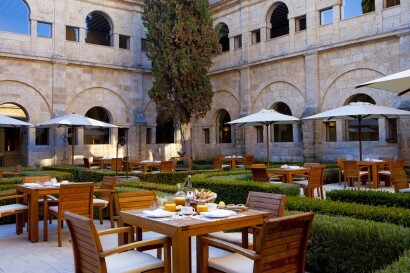 • One of the best hotels in Spain for Spring & Summer by The Telegraph 50. • Best new Spa & Wellness property and Best Wow factor by Spa Finder magazine. • Best hotel in Spain 2016 by TripAdvisor. 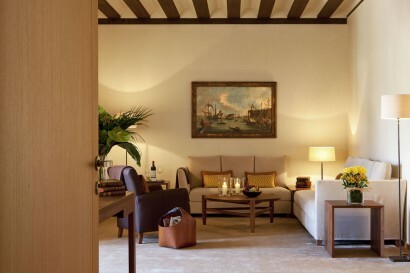 • One of the ten hotels that make you feel at home by The New York Times. • Cultural Heritage Award of the European Union by Europa Nostra. • One Michelin Star for Refectorio Restaurant.